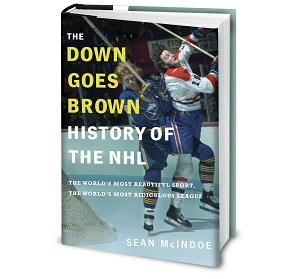 Down Goes Brown: Did NHL GMs make the right recommendations on fighting? Yes and no. Did NHL GMs make the right recommendations on fighting? Yes and no. Damien Cox is reporting that NHL GMs are recommending a pair of changes to fighting rules. The first change would see a ten-minute misconduct handed out to players who fought right after a faceoff. This new rule would be meant to eliminate "staged" fights (like this classic), and it would apparently be left to the referee's discretion to determine how much time and/or game action needs to pass before players can fight. I'll predict it here now: this change is going to backfire. Yes, some of these faceoff fights are the meaningless kind that nobody seems to like -- two heavyweights squaring off for no reason beyond padding their stats and justifying their nightly four minutes of ice time. But many faceoff fights aren't meaningless at all. In many cases, it's simply the first opportunity between two guys with legitimate reason to fight. For every Laraque/Ivanans, there's a Mayers/Kostopoulos, or Belak/Janssen. But even putting that distinction aside, it's hard to see how this new rule will dissuade two players who want to fight from doing so. Instead, we'll get players half-heartedly "playing" for a few seconds to avoid an additional penalty. A shove here, a push there. Maybe skate a few strides and then "accidentally" collide, and off you go. If you thought some of these fights seemed staged before, wait until you watch players go through the motions before finally dropping the gloves. Meanwhile, without clear direction from the league referees will be on their own to decide when to hand out the additional minutes. Think back to the instigator rule's debut in 1992 and the confusion around how to call it, with different referees interpreting the rule in shifting and confusing ways. Let's hope the rules committee will polish the rule before it goes into effect. Otherwise, we could be looking at a season's worth of silliness. The second change is intended to curb instances of players responding to clean hits on a teammate by initiating a fight, a trend that appeared to increase dramatically this season. No new rule will be introduced, but referees will be encouraged to apply the instigator rule in these cases. While I realize from past discussion that I'm all but alone on this, I like to see a guy come to a teammate's aid after a hit, even a clean one. Players often have a choice between trying to take an opponent out of the play and trying to take him out of a game, and I don't mind seeing teammates hold guys accountable for choosing the latter option. That said, there's absolutely no reason why these sorts of reactions shouldn't fall under the instigator rule. Apparently referees need a reminder of that, and I have no problem with the NHL giving them one. So did the NHL GMs do the right thing? Let's call it even. i don't know about the stupid faceoff rule but, the instigator needs to be implemented, PROPERLY. Theres been too many times when good clean hits are followed by silly fights. The problem here is the same as with other 'referee discretion' rules - it becomes purely subjective. I do think a fight that follows from a cheap shot or even borderline hit is good, and refs should hold off on the instigator - but how often can players make an immediate, on-ice assessment of what constitutes a clean hit and what's borderline? I don't mind referee's discretion. In fact, I prefer it to "zero tolerance" rules like the puck-over-the-glass, which more often than not just result is ridiculous calls that nobody believes are really deserved. That said, the rules themselves should be crystal clear. And this one isn't. Maybe it will be by the start of the season. Otherwise, each individual ref will be coming up with their own rules about when fighting is allowed, and that will end up being an embarassment. Let the referees use their discretion for what's on the ice, but not what's in the rule book. I was watching that 5th estate special the other week and McSorley was saying that without guys like him Gretzky and others wouldn't have had such long or productive careers because teams would be powerless to protect them from clean hits. You know what though? I have no problem with star players getting taken out, put off their game or having their careers shortened. If it's a hit to the head, charging or whatever than it's the refs/leagues responsibility to step in but good clean body-checking is a tool of the game and if you can use it to take out or reduce the role of the other teams star player I don't see why you should then have to defend yourself against the other team's enforcer. I'm about to be that guy who writes a big long post about his glory days, with only a few sketchy (at best) references to the subject at hand. When I played, my game was all hitting. I was a bit on the small side, but went up and down my wing putting my shoulder into the chest of anything that moved. I had the art of open-ice hitting down to a science, and laid out guys twice my size all the time. It was all eye-contact. Anyway, I never fought - but we're talking minor hockey here, so everyone had a full cage and fights resulted in multiple-game suspensions. But I always wondered how my game would have progressed if took things to the junior ranks, or even the pros. Is a player allowed to throw monstrous, get-out-the-stretcher hits without fighting afterward? If I ran over Mikko Koivu and was jumped by Derek Boogaard - AND TURTLED FOR MY LIFE, would the regulars at hockeyfights.com call me a wimp coward chickenshit pukebag who should eat cyanide and hurl himself into an airplane turbine? Today's code seems to include a clause where players have to "back up" anything they do on the ice. Stickwork, sure. Running your mouth, absolutely. But solid, clean hitting? I _love_ the team-first mentality of seeking immediate retribution when the opposition takes liberties with your teammates, but I'm a bit up in the air about weather big, clean hits warrant that sort of retribution. If it's clean, it's kind of your teammate's own dumbass fault for having his head down in the first place. Think of Wendel's reaction to big Charlie Bourgeois after the destruction of Bruce Bell. That's the angle I'm getting at. I agree generally that putting emphasis back with the refs' on-ice discretion isn't a bad idea, but in this case I think it would be awfully hard to say 'I didn't call an instigator because the hit was cheap'. Concretely, does that mean that the ref has to be planning to call a penalty on the initial hit - and if so, no instigator is warranted if a fight ensues? I guess that might work, but then the NHL looks like it's actually condoning fighting in certain circumstances (rather than just tolerating it). What's a "clean hit" though? How many head shots have we seen with a guy laid out on the ice when the ref doesn't call a penalty? So if say, Sutter gets laid out by Weight, you have to just stand there and stare because it's a "clean hit"? Enforce this rule as long as you clean up the hypocritical cheap shots that go uncalled. Otherwise, get lost. Guys getting misconducts for staged fights isn't going to stop them from doing it. Let's face it, how often were they going to get on the ice after the fight anyway? Now, if somebody else has to serve the additional 10-minute penalty, maybe that will make a coach think twice about tapping on his heavyweight's shoulder...especially in the 3rd period. Maybe an unpopular opinion, but the guys running around the ice looking to hit any and all things moving are more of a problem than the heavyweights...IMHO. Who are the heavies really going to hurt? Each other. It's just like gangbangers shooting gangbangers...go ahead, be my guest. But a guy like Tootoo who has no other purpose but to run around trying to put everybody into the 5th row is, to me, even more useless as a hockey player than guys like Belak, Big Georges, and Boogard. Call it "clean hitting" all you want, but when he hops over the boards his intentions are to try and hurt as many guys as possible on every shift. That isn't hockey. I dislike both proposed changes. If they want to take fighting out of the game, fine, just do it. I would disagree with that decision, but I'd respect it more than these half-measures that the NHL is constantly trying to come up with. In my opinion, by far the most important thing to address is what happens during the fight itself. Penalize players who take off their own helmet, attempt to take of their opponent's helmet, or violently throw the oppposing player to the ice. Also, as much as I love Wendel, those days are gone, and I think you should be subject to HEAVY suspensions for hitting a player who is already on the ice, or for continuing to punch once the linesmen have moved in. Both rules stink to high heaven. Neither will have the effect of curbing the type of head shots that the players have asked to be removed from the game. It really is a wasted effort and will more than likely dramatically decrease fighting which in turn will dramatically decrease my enjoyment and involvement in this sport. I've never been a fan of modern 'heavies' in the first place. Top fighters in the 70's and 80's were often under 6' and 200 lbs. Now it's like being a 6'4" 250+ irradiated mutant is becoming the prerequisite. And I'm all about respect between combatants, but I don't think that calm, friendly, "want to? ok. spread out? good luck man." type fights with 45 second Youtube square-offs has much of an uplifting effect on team morale. Well said sir, I can't argue too much with that at all. As far as the 'code' is concerned, I suppose the Wendel Clarks, Scott Stevens' and Cam Neelys of the universe are more within their rights to demolish the opposition as they bring/brought so much more to the game. Maybe if Foote or even Forsberg had rocked Naslund instead of Stevie Moore, none of that whole ugly aftermath would have taken place. Weird. Iv often wondered too why all the concern about fighting. The NHL didn't address the head shot issue and certainly didn't address the main reason that poor boy was killed (helmet, head, ice) so what gives? I figure this was all an attempt to do something with little change in the NHL product. So now a fight may happen if in the course of play two guys take a dislike to each other. That dislike may be a result of the "clean hit" form an earlier shift...and in that respect the rule change doesn't address what it set out to do. So we will not see a scott stevens slide agross and destroy a player, stand over his dead body and the cameras and news will lovingly hold on that image for all to see... violence in hockey? hmmm now two shifts later our scott Stevens gets caught in the gun sights of the other teams "checking expert" (the real new NHL thug) and gets creamed.. retribution is served... OR perhaps an invitation to settle mano e mano and then a guilt free, misconduct free, fight ensues . What was the rule change supposed to REALLY do.... I think something entirely different happened here. this was a move to ramp up hitting and fights but in a way that controls the barbaric staged look of it on tv, for the uninitiated.